Support an amazing cause, Yoga Reaches Out and the Boston Children’s Hospital, while getting in an incredible workout with 4 teachers!! Join us for this extra special combo class that isn’t just good for your body, but good for your soul as ALL proceeds go to Yoga Reaches Out and the Boston Children’s Hospital. This super special 75-minute Combo Class begins at 10 am and we’ll kick off our event with Erin teaching 20 minutes of Bootcamp. Then we’ll focus on strength with 20 minutes of Barre with Izzy! After that we’ll stretch it out and cool down with 35 minutes of Yoga with Chia and Maura. This is a great combination and will leave you feeling strong, centered and energized. Afterwards enjoy a couple of beers and cheers to your hard work and generous donations!! All levels are welcome! Please be sure to bring water and a yoga mat, and arrive 10 minutes early. 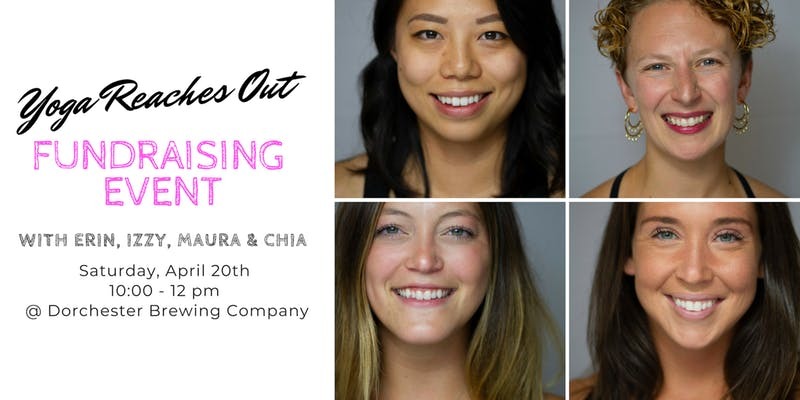 Tickets are $25 and include: Bootcamp + Barre + Yoga + 2 flight Beer Tasting and ALL PROCEEDS to go Yoga Reaches Out and the Boston Children’s Hospital. Extra donations will be accepted the day of the event via check and cash. Only 30 spots available so sign up now! Erin Madore is the owner of Savin Hill Fitness Studio(opening May 2019) and she is a Yoga Teacher, Personal Trainer, Reiki Master and Spin Instructor. Izzy Ortigoza is SHFS’s Assistant Manager and a Yoga Teacher, Personal Trainer and Barre Teacher. Chia and Maura will also be teaching at Savin Hill Fitness Studio!